It’s hard to find a 1919 penny in pocket change, but it happens. In fact, one of the oldest pennies I ever found in circulation was a 1919 wheat penny! 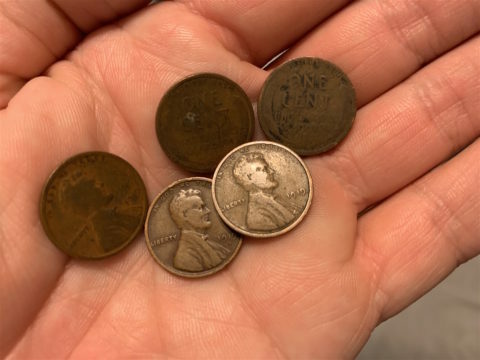 So, 1919 pennies don’t turn up in loose change too often… but does that mean they’re rare? While millions of 1919 Lincoln cents were made, many have disappeared. Through the years, many have become worn beyond recognition, buried and long forgotten, destroyed by floods and fires, or ruined by cleanings and other forms of coin abuse. Today, most existing 1919 wheat pennies are kept in coin collections, tucked away in penny jars, or secured in estate holdings. So, while it’s challenging to find 1919 Lincoln wheat cents in circulation, they aren’t rare coins. If you’re like I was when I found an old wheat cent, you’re probably itching to know what your 1919 wheat penny is worth. 1919 penny with no mintmark — A 1919 Lincoln cent with no mintmark on the obverse (heads side) was made at the Philadelphia Mint. Heavily worn specimens are worth about 10 to 65 cents. Uncirculated pieces that have never been spent as money are worth a lot more. For example, chocolate brown uncirculated specimens are worth anywhere from $15 to $50 while top-condition mint state examples with original reddish color and full luster have a value of more than $5,000. 1919-D penny — A 1919-D penny is from the Denver Mint. It’s worth about 30 cents to $7 in well-worn condition. A brown-colored uncirculated 1919-D penny is worth $75 to $200 and up, while a 1919-D penny with original red color goes for around $200+. 1919-S penny — A 1919-S penny was struck at the San Francisco Mint. It has a value of about $1 to $10 in well-worn grades. Uncirculated specimens are scarce, and they carry values of about $60 to $150 for a typical 1919-S penny with chocolate brown color. A reddish-colored uncirculated 1919-S penny is worth anywhere from $400 to $4,000, depending on condition. *Values above are for 1919 Lincoln cents with no signs of damage — including cleanings, holes, bends, heavy nicks, or other types of problems. Some of the most valuable 1919 Lincoln cents you can hope to find in your pocket change are those containing errors or varieties. These old error coins are highly rare. 1919 doubled die penny — There’s at least one known type of doubled die 1919 penny, showing doubling in the inscription E PLURIBUS UNUM and in the wheat stalks. Values for this piece are all over the board, but doubled dies like this one are often worth $100 to $200. 1919 off-center penny — A coin may be struck off-center when it shifts or is misaligned during striking. Errors involving a strike being only a bit off center (say 1% to 3%) are pretty common and carry little, if any, extra value. But a 1919 wheat penny struck 5% to 10% can be worth $10 to $20 or more. And a 1919 penny struck 50% off center or more can be worth many hundreds of dollars. 1919 penny with a repunched mintmark — Back in 1919, mintmarks were individually punched onto each working die, and sometimes they were stamped multiple times at different angles, or even different locations. These cool errors can be worth anywhere from $5 to $25 apiece — sometimes more. 1919 penny with a die crack or die cud — As coin dies age through use, they sometimes become brittle and crack. When cracks form in the die, they transfer raised blobs, cracks, or lines onto the coin. And when a die crack forms on the rim, it’s known as a die cud — one of the most desirable types of die cracks. Die crack errors range in value, depending on the size and location of the error. Minor die cracks forming only a small line between letters might be worth a dollar or two. Die cracks running across the entire coin can bring $50 to $100 or more. Major die cuds are often worth well over $150. I love Lincoln pennies just about as much as the next person. Know what else I enjoy?… Finding out cool info about these old pennies, so I can expand my knowledge base and maybe even impress my friends and family with some cool trivia! #1 – What’s the most valuable 1919 wheat penny? #2 – How many 1919 pennies were made? #3 – Who designed the Lincoln cent? Noted sculptor Victor David Brenner designed the Lincoln cent in 1909. He also designed the wheat stalks symbolizing national prosperity on the penny. That motif lasted until the introduction of Lincoln Memorial pennies in 1959. And Brenner’s initials, VDB, appear below Lincoln’s shoulder on the obverse (heads side) of the 1919 wheat cent. What Else Was Going On When Your 1919 Penny Was Made? The Treaty of Versailles was signed on June 28, 1919, officially ending World War I between Germany and the Allied Powers. Sociopolitical activist Mahatma Gandhi began his nonviolent protests against British rule in India. The 18th Amendment to the US Constitution was ratified, prohibited the sale of alcoholic drinks throughout the United States. Dial telephones debuted to the public after their introduction by American Telephone and Telegraph Company. Popular movies in 1919 included True Heart Susie, Blind Husbands, Broken Blossoms, Daddy-Long-Legs, and The Miracle Man. Top songs in 1919 were “Oh! What A Pal Was Mary” by Henry Burr, “I Might Be Your Once-In-A-While” by Ida Heydt & Male Trio, and “Just Like The Rose” by All Star Trio.